bloggers and it is very easy to use and install. On Tuesday, Canonical released a kernel patch to address security issues in the 6.06, 7.04, 7.10 and 8.04 releases of Ubuntu, Edubuntu and Xubuntu. The vulnerability could allow an attacker to execute arbitrary code as root, or crash the system, leading to a denial of service. "It was discovered that there were multiple NULL-pointed function de-references in the Linux kernel terminal handling code," wrote Ubuntu administrators in the e-mail. "A local attacker could exploit this to execute arbitrary code as root, or crash the system, leading to a denial of service." The e-mail also detailed a number of other bugs that could be exploited by an attacker who already had some level of access to a computer running Ubuntu. Nehalem is the codename of the new Intel CPU with integrated memory controller that will reach the market next month and that will be called Core i7; this architecture will also be used on CPUs targeted to servers (Xeon) and, a few years from now, it will also be used on entry-level CPUs. CPUs based on this architecture will have an embedded memory controller supporting three DDR3 channels, three cache levels, the return of HyperThreading technology, a new external bus called QuickPath and more. Based on Intel Core microarchitecture. Two to eight cores. Integrated DDR3 triple-channel memory controller. Individual 256 KB L2 memory caches for each core. 8 MB L3 memory cache. New SSE 4.2 instruction set (seven new instructions). HyperThreading technology. Turbo mode (auto overclocking). Improved virtualization performance (60% improvement on round-trip virtualization latency compared to 65-nm Core 2 CPUs and 20% improvement compared to 45-nm Core 2 CPUs, according to Intel). 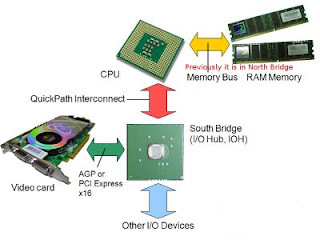 New QuickPath Interconnect external bus. 45 nm manufacturing technology at launch, with future models at 32 nm (CPUs codenamed “Westmere”). New socket with 1366 pins. SSE4.1 instruction set (47 new SSE instructions). Enhanced Intel Dynamic Acceleration Technology (only on mobile CPUs). Fast Radix-16 Divider (FPU enhancement). Super Shuffle engine (FPU enhancement). Enhanced Virtualization Technology (between 25% and 75% performance improvement on virtual machine transition time). Almost stealthy, AMD has launched four new processors. See them below. Considering the ever growing need of speed and efficiency, understanding Double-Data-Rate (DDR) memory is important to system developers. DDR memory's primary advantage is the ability to fetch data on both the rising and falling-edge of a clock cycle. DDR1, DDR2, DDR3 memories are powered up with 2.5, 1.8 and 1.5V supply voltage respectively. Temporization is another characteristic of of DDR memories, memory temporization is given in a series of numbers, such as 2-3-2-6-T1, 3-4-4-8 or 2-2-2-5 (CL-tRCD-tRP-tRAS-CMD) for DDR1. These numbers indicate the number of clock pulses that it takes to perform a certain operation- smaller the number faster the memory. DDR1 with a maximum rated clock of 400MHz and a 64bit(8 bytes) data bus ( Now it is obsolete) . DDR2 with a maximum rated clock of 800Mhz and a 64bit(8 bytes) data bus. DDR2 memory is physically incompatible ith previous generation of DDR memories. DDR2 memories include 400Mhz, 533Mhz, 667Mhz and 800MHz versions, while DDR3 includes 800MHz, 1066Mhz, 1333MHz, and 1666Mhz versions. A newly introduced automatic calibration feature for the output data buffer enhances the ability to control the system timing during variations in voltage and temparature. DDR3 devices introduce an interrupt reset for system flexibility. The controller in DDR2 memories works by preloading 4 data bits from the storage are(prefetch) while DD# works by loading 8 bits in advance. If you are doing any kind of PHP development, you'll almost always be using Apache along with it. Here's the way to get PHP up and running on your Ubuntu box. If you are running Ubuntu and want to use the Tomcat servlet runner, Some times the apt will not work correctly. You can try the following method it will work. Now we'll download and extract Tomcat from the apache site. cpuinfo - Information about the Central Processing Unit. pci - Gives tons of hardware information about all PCI devices on the system. As you can see, there is literally hundreds of files in the /proc filesystem that may be read and checked for information, and we haven't looked at half of them here. First of all, the filesystem contains a large set of numbered directories that come and go. These numbered directories contains information about all of the currently active processes on the machine. When a new process is started, a new directory is created in the /proc filesystem for it, and a lot of data is created within it. eg: commandline with which the program was started with, a link to the "current working directory", environment variables, where the executable is located, and so on. Most of the information in the files are readable , except a few of them. However, a few of them you should not touch, such as the kcore file. The kcore file contains debugging information regarding the kernel, and if you try to 'cat' it, your system may very well hang up and die. If you try to copy it to a real file on the harddrive, you will very soon have filled up your whole partition, and so on. What all of this tells you is to be very careful. Mostly, none of the variables or entries in the /proc filesystem is not dangerous to watch, but a few of them are. Run sudo update-java-alternatives -l to see the current configuration and possibilities. Run java -version to ensure that the correct version is being called. The new Solid State Disks (SSD) will replace HDD soon, MICRON has announced two new lines of flash memory solid state drives (SSDs) using high-performance single-level cell (SLC) NAND technology, aimed at enterprise server and notebook PC applications. 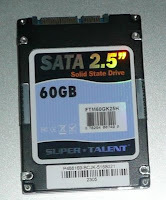 SSDs offer performance advantages, power savings and reliability benefits over hard disk drives (HDDs).SSDs perform about ten times faster than HDDs, exhibiting 0.8 ms data access latency compared to average HDD data seek latency of approximately 8 ms.
SSDs consume about one-tenth the electrical power of typical HDDs, running at 0.3 watts when idle and only 2.5 watts while active, whereas HDDs usually draw between 8 to 28 watts. Since they use so little power, SSDs also require virtually no cooling, which also reduces power consumption. SSDs are also more reliable than HDDs. Using wear-leveling technology, SSDs offer mean time before failure (MTBF) ratings of approximately two million hours compared to typical HDD MTBF ratings of between 300,000 to 500,000 hours. SSDs for notebook PCs will come in 1.8-inch and 2.5-inch modules with capacities from 16GB to 256GB. the beam to write data holes in a master disk, each separated by 70 nanometres. sudo iwconfig wlan0 essid "ESSID_IN_QUOTES"
Double-click auto_super_grub_disk_1.0 icon, install it, and reboot. On the next boot, select the UNetbootin-supergrubdisk menu entry; this will launch the Auto Super Grub Disk. Do nothing till you see your Grub menu again. Next time you boot Windows, click yes when asked to remove UNetbootin-supergrubdisk to remove the Super Grub Disk menu entry.